Energy healing takes many forms. Practitioners and clients work together in a healing partnership to create an essential balance of life force energy, also known as chi or prana. By balancing life force energy via energy healing techniques, it is able to flow freely to create harmony, balance, and health. When practicing energy healing, an energy healing practitioner trained in a specific technique intuitively pays attention to his or her own energetic system as well as the energetic state of the client. Using either an intuitive approach or following a specific pattern of energy generation and keeping in mind the client's stated needs and intention, an energy healing practitioner strives for resonance between the two energy systems using either a hands-on (touch) or hands-off approach (non-touch) approach, or both. During the session, the energy healer channels the energy while the client draws it in. This creates resonance between the practitioner's and client's energy, which facilitates balance and harmony by removing blockages, absorbing excess energy, and enhancing insufficient energy in energetic centers and pathways. The result is a freer flow of energy which creates a more harmonious balance of body, mind, and spirit that can lead to better physical, spiritual, mental, and emotional health. The human body has several energy centers and pathways that unite the physical body (body and mind) with the etheric body (emotions and spirit). Each of these energy centers or pathways provides a vital link between body, mind, and spirit, and when there is an imbalance or blockage in any of them, the result can be dis-ease (lack of ease) that manifests as symptoms, lowered life force energy, physical or mental illness, emotional imbalances, loss of vitality, and more. Symptoms of dis-ease can range from mild physical, spiritual, mental, or emotional symptoms to full-blown serious dysfunction or illness of each. 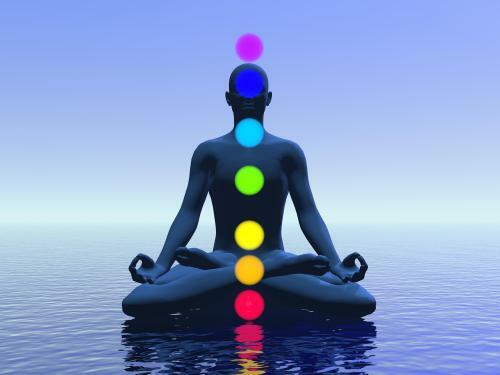 One set of energy centers is the seven chakras which run roughly along your spinal column. Chakras are visualized as wheels of colored light energy that rotate in a clockwise direction, and each affects different parts of your body as well as various spiritual, emotional, mental, and physical aspects. Energy needs to be balanced and flow freely among the chakras in order to achieve harmony and health. 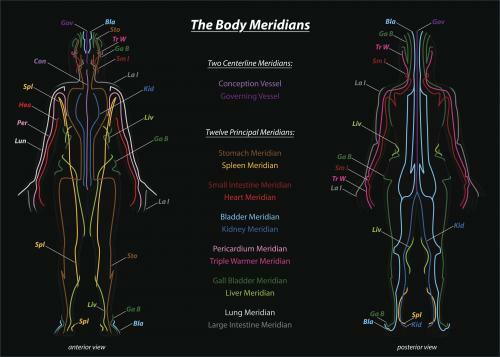 You also have 12 primary energy pathways throughout your body known as meridians. These pathways are divided into yin and yang pathways. Ideally, energy flows freely and evenly through each meridian in order to allow for balance, harmony, and health. However, when energy becomes imbalanced or blocked, issues of the body, mind, emotions, and spirit can result. Techniques such as acupunture focus on balancing the energy in the meridian pathways to allow for a free flow of energy throughout the body. Your auric energy fields complete your energy anatomy. The aura surrounds you and connects your energy to universal energy. It is visualized with seven distinct layers reflecting various aspects of your body, mind, and spirit. Colors of the aura may change to reflect your current physical, emotional, mental, or spiritual state. There are many basic principles of energy healing common to all practices. Everything in the world consists of energy, including people. All physical matter is made up of vibrating strands of energy. When two objects or beings vibrating at different energies are placed near one another, their energy adapts and they begin to exhibit the same vibration or resonance. This is a scientific principle known as entrainment. This principle can be seen when mechanical metronomes, all swaying at a different rate, entrain and their pendulums synchronize. All human beings are both physical (body and mind) and etheric (emotions and spirit). Energetic balance must be achieved among all of these parts in order to create harmony, health, and ease. As conscious beings, everyone has the power to assist healing in others by sending energy to them through touch, intention, and tools such as sound or crystals. The energy healer and the client are partners in the energy healing process. The practitioner channels the energy while the client draws the energy provided into his or her body. All healing is ultimately self-healing. Energy healing exists to serve the highest and greatest good of all parties involved. The above basic principles are found in all methods and modalities of healing energy including the following. Reiki is a form of hands-on and distant energy healing that originated in Japan. Practitioners must be attuned to Reiki energy by a Reiki Master-Teacher in order to channel the flow of the energy. In crystal healing, the energy of crystals placed in proximity to the human body affect the various energy fields in order to create balance and remove blockages. All energy has vibration. In sound healing, various sound healing tools such as singing bowls are played in order to create a vibration that harmonizes through entrainment with the energetic systems to facilitate balance. Developed by energy healing practitioner Mary Maddox, Essential Energy Healing is a hands-on or hands-off approach similar to Reiki to bring balance to energy systems. Also known as tapping, EFT stimulates various meridian points via firm tapping and spoken intention/affirmation. EFT practitioners require certification. Energy healer Richard Gordon developed the Quantum-Touch technique that can share energy either hands-on or at a distance. Practitioners must be trained at an approved workshop or series of workshops. In acupuncture, practitioners use techniques including needles in the body's meridians to clear blockages and correct imbalance. Acupuncture practitioners must be certified via education through an accredited organization. Acupressure is a great alternative to acupuncture for the needle-phobic. In this practice, practitioners help balance energy by applying pressure to specific points along the meridians. Acupressure is considered a massage technique, and appropriate massage licensing and training is required. Many people are surprised to learn homeopathy is an energy healing technique because it is not a hands-on technique like many others. Homeopathic medicine relies on the principle of like curing like; in other words, the thing that can create symptoms and energy imbalances can also cure them. Homeopathic remedies, usually small pellets, are created by diluting a substance so significantly in water that none of the original material remains. Instead, the resulting remedy vibrates with the energy or essence of the original substance without containing any of it. Homeopathy is usually practiced by naturopathic doctors who receive an educational degree. Created by Dr. Randolph Stone, Polarity Therapy is a technique that creates balance of yin and yang, as well as of the different classic elemental energies (earth, air, fire, water, ether). Polarity Therapy requires specific training to practice. Qigong is a form of movement healing that can balance energies, particularly yin and yang. As you move through the qigong forms and movements, you facilitate energy flow throughout your body. You can take qigong in many local fitness centers. Yoga is another form of movement that promotes energy healing. There are many types of yoga, but most involve asanas, or poses, that allow you to facilitate the flow and balance of prana in your body. Yoga instructors must complete certification and a few hundreds of hours of practice. Healing Touch is a hands-on technique requiring training and certification. Integrated Energy Therapy works with violet energy rays of angels. Matrix Energetics is a form of energy healing developed by a chiropractor. Pranic Healing helps create balance of prana, or life force energy. Within each modality, there is a myriad of methods. This occurs because each practitioner brings his own unique gifts and skills developing his own personal method, technique, and program. Just as clutter causes a build up of negative, stagnant energy in your home and must be removed to allow the flow of positive energy, damaging clutter builds up in your energetic pathways. Stress, illnesses, abuse, negative emotions, injury, and other life experiences can all contribute to or cause these imbalances, which hamper the flow of your prana or chi. Rebalancing these energies, regardless of what causes them, through energy healing techniques can help return your energetic systems to optimal flow, which can lead to greater ease, harmony, balance, and health.